With two letter-sized sheets of paper and your color printer you can create a beautifully detailed room ready for elaborate dinner parties. When you’re done sampling the fruit on the table, fold up your dining room and tuck it away. This file contains templates for the two interlocking pop-up cards and a cut and fold guide. 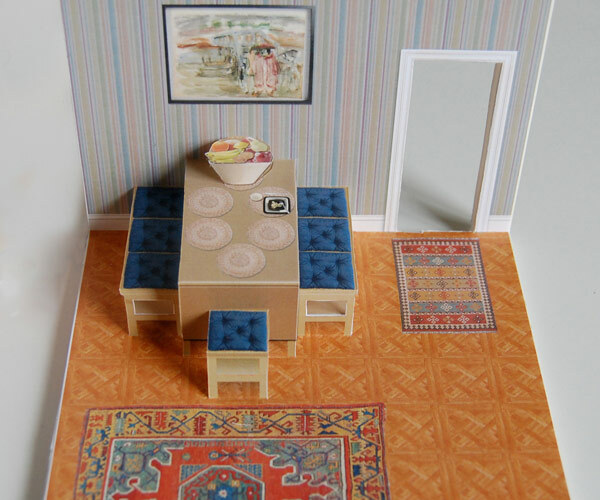 This video shows the template from the pop-up paper house kit being folded and assembled. To make this room using the download you will first need to cut and score your print-out, using the guides provided with your files.